In honour of their one-year anniversary, Art Kaam Gallery held a group show displaying works by several Pakistani artists on November 16th 2018. Through their attentive selection of artists, the gallery provided a range of work from both established and emerging artists of the country for the exhibition, which was titled ‘One’. Since its inception, Art Kaam has held 18 shows, which include 7 solo and 11 group exhibitions. They have exhibited the works of 86 artists and should be credited for the opportunities provided to a number of recent graduates to showcase their work, particularly 3 group shows that showed the work of recent alum from Indus Valley, Karachi University and Karachi School of Art. With a mixed array of talent and medium, the gallery was adorned with multiple paintings, each sporting a visual distinctive to the artist’s calibre. Among the artist showcasing their work was Abid Hasan. His enormous and striking piece ‘Buffering’ was made up of treated gold and silver on canvas. As the artist explains, that by allowing these materials to face a variety of natural forces, such as wind and water, something new is created through the manipulation. Rather than focuses on imagery, Hasan’s work allows the process to speak and affect the end product, which result in an abstraction that guides the viewer’s mind to endless possibilities. Following in true form with her own visuals of abstraction is recent graduate, Mashal Khan. 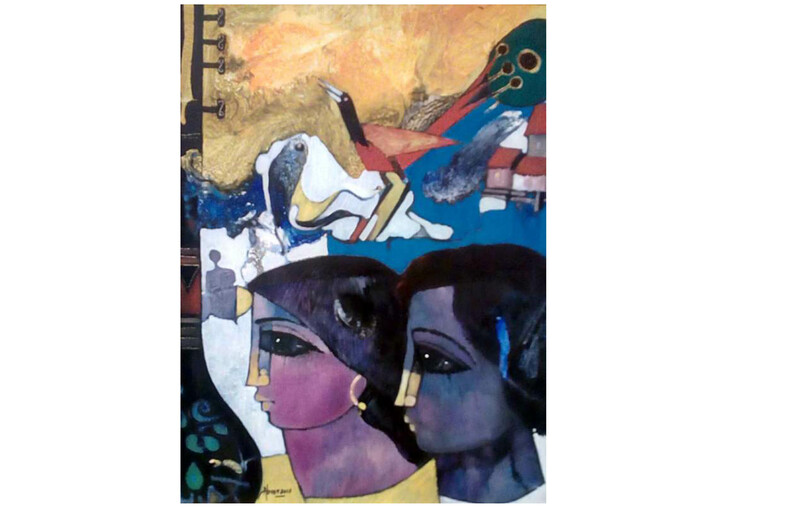 Again another great painting, her diptych titled ‘Alfaaz’ was created using acrylic on wood panel. From afar the painting appears as a perfectly positioned coffee-spill stain but it is only on closer inspection that one realizes that it is actually created by minute text, which add a whole new level of intrigue for the viewer. Jawad Qamar was another important addition to show because of his intricately detailed calligraphic paintings. 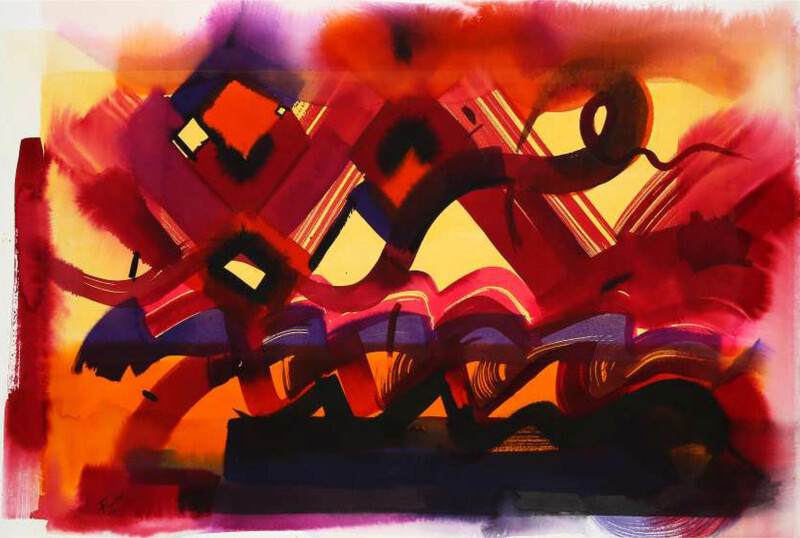 For him, calligraphy creates a link to the spiritual world and so by honing in on his technique for the past two decades, it allowed him to create new layers of depth and beauty to the paintings. His dexterous work also focuses of floral and geometric designs that mostly adorned the walls of ancient mosques and palaces. 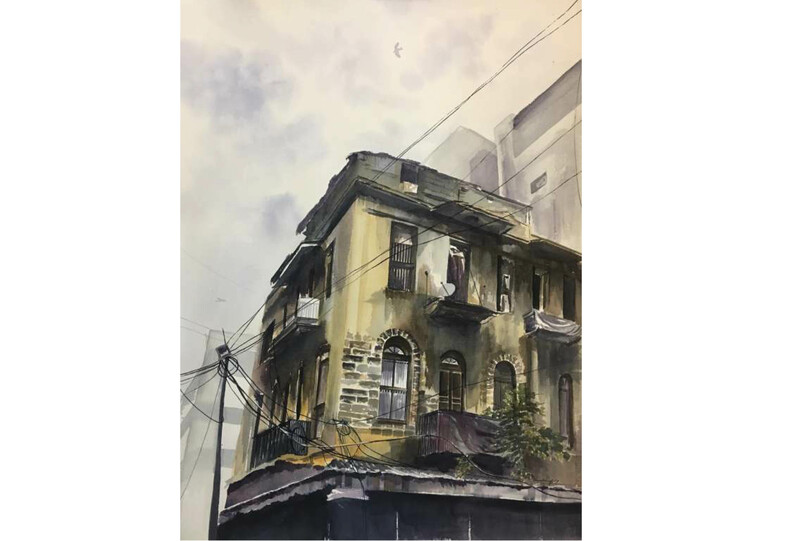 Bringing forth their vivid watercolour pieces were a number of artists such as Arif Ansari, Mubashra Anwar, Sadia Arif, Ali Sajid and Anum Ashraf. 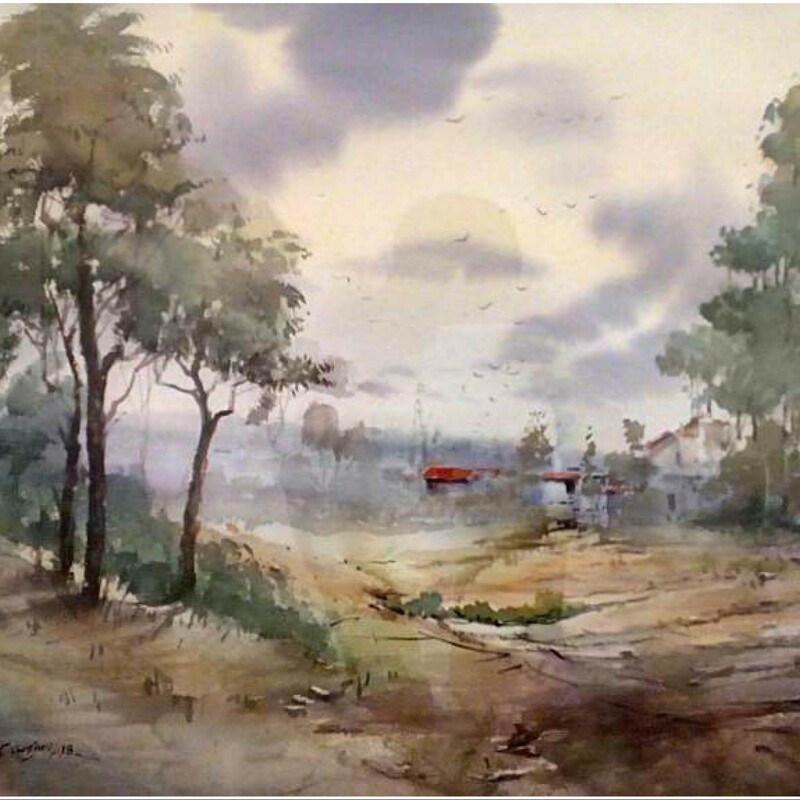 Each of their paintings wonderfully captured different elements of the country. While Sajid painted the Walled city in Peshawar, Ashraf gave the audience a taste of the forgotten colonial buildings, many of which are being left to decay in Karachi. 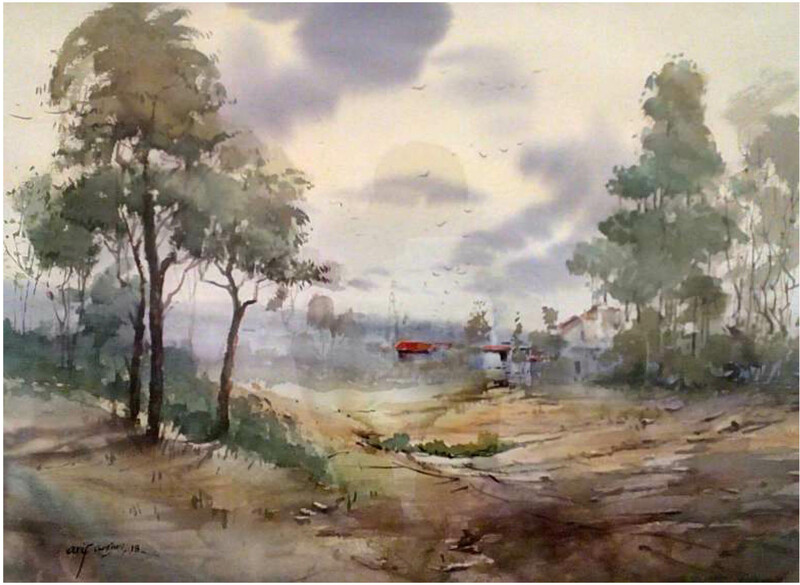 Ansari, Anwar and Arif stepped away from construction and focused their paintings on the sublime nature of the country. Themes of Sufism and Whirling dervishes were also present for the group exhibition, thanks to the works of acclaimed artists, Khusro Subzwari and Sadaf Farsat. Self-taught artist, Masood Khan was the only artist to present a self-portrait painting. Using acrylic on grout, Khan painted an upright male surround by goats and other animals. There was an effervescent childlike quality to the painting and its carefully planned composition made it hard to miss among the other pieces. The use of oil and acrylic was also evident in this exhibition. Wondrous realistic paintings by artists such as Ajab Khan and Akram Spaul were also part of the show. These renowned artists have always had an acute attention to detail while building on themes personal to each. Hanif Shehzad, known for his detailed landscape, also exhibited work in the show. 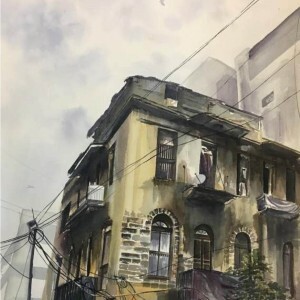 His painting depicted the everyday scene in Empress Market, Karachi, which seems even more pertinent now after the recent clearing of stalls and carts around the area. Other artists from the show included, Abrar Ahmed, Ameerah Motiwala, Fariya Zaeem, Hussain Chandio, Khadijah Amin, Nisar Ahmed, Salman Farooqi, Shahid Ahmed Zaki and Shazia Salman. ‘One’ provided its audience with culmination of the gallery’s hard work and achievement thus far. It also reminded one not only of the gallery’s dedication to rising talent but also their increasing interest in self-taught artists who have worked to hard to hone in on their own talent and prosper without the expected backing of formal training. ‘One’ at Art Kaam gallery was exhibited from 16th -24th November 2018.